Laplanders, living in the most northern parts of Europe, have always valued harmony with the surrounding nature. For them, the knife is a personal tool that has evolved throughout the years to become a very practical, daily item. Handmade by master smiths, Saami knives are known for their sharpness and beauty. 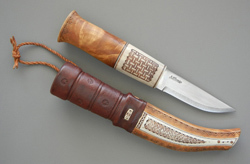 For Laplanders, the knife is also a status symbol, reflecting the role in the community. Women as well as men carry a knife or two. The most common material for Saami knives are reindeer antler and bone, which is praised for its ability to keep its shape for years and years to come. 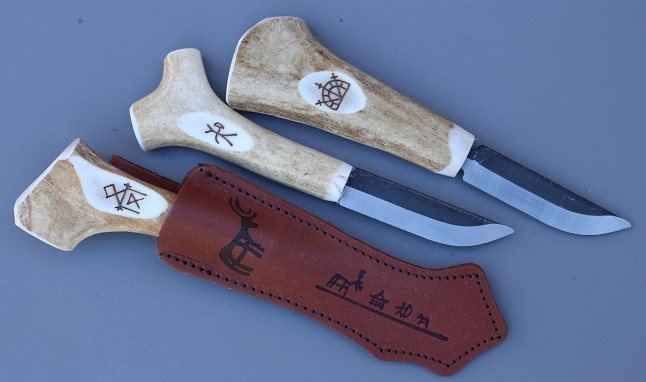 Kellam Saami Knives line features the pearls of the northern knife making tradition.